Every now and then, a new proposal for a downtown transit circulator comes up in Yakima. Most recent was the idea of reintroducing streetcar service on Yakima Avenue using the heritage streetcars currently owned by Yakima Valley Trolleys. In the past, there’s even been proposals to add new lines just about everywhere in the city, from the former mill site just northeast of downtown or the SunDome at the Yakima County Fairgrounds, or even a proposal to run a commuter-service along the line between Selah and Yakima. 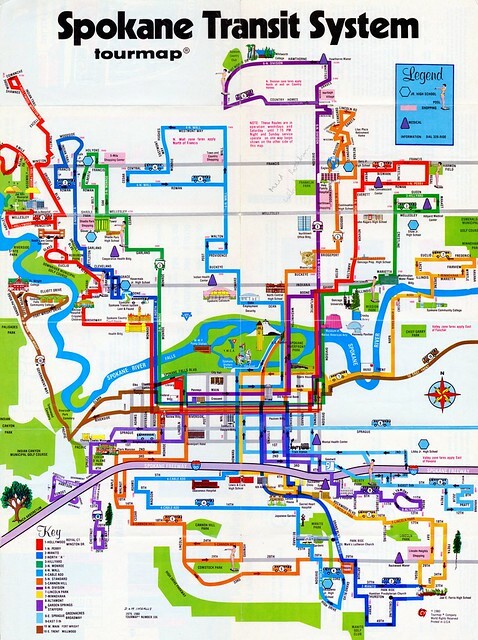 Usually with downtown circulator proposals, most cities propose running them with “replica trolley” buses, and Yakima was no exception to that trend when they tried it in the early 1990’s. Starting operations in the first week of June 1991, the trolleys ran on two routes in Downtown Yakima. 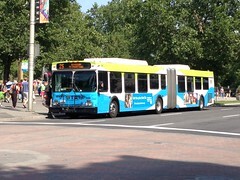 One route served Yakima Avenue directly, while the other weaved along side streets in the area connecting riders to the main shopping destinations on Yakima Avenue. To start the service, the city spent $109,000 each on four new “replica trolley” buses, along with an additional $60,000 to promote the service to residents and visitors. Unlike conventional Yakima Transit routes, the bus operators on the trolley service had special uniforms that among other things included a derby hat and a bowtie. The service charged no fares, and riders could hop on and off at multiple stops along Yakima Avenue, along with stops at parking lots near the downtown shopping areas. Of course, the service was not without controversy. Originally backed with unanimous support from the city council, it quickly became a lightning rod for criticism. Residents questioned why the city was spending nearly $400,000 just to operate the service for the first year when Yakima Transit routes already ran in the area, and merchants outside of downtown were upset about the “favoritism” the city was showing to downtown merchants with the service. Support for the trolley service started to erode soon after that. 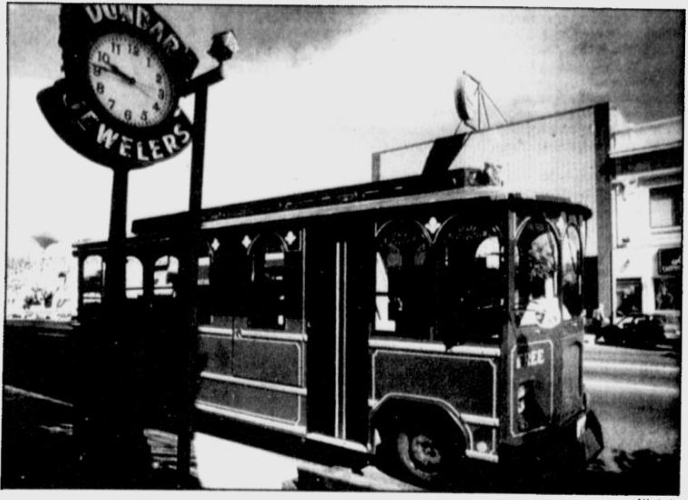 It was around this same time that Spokane Transit Authority was getting ready to launch their “replica trolley” service between the newly opened Plaza and the North Bank area just north of downtown. 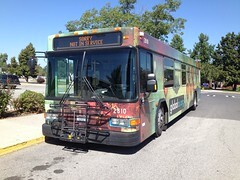 (This is the service that now operates as Route 1.) One local journalist proposed having STA buy the buses from Yakima, but by then they had already secured their own buses for the service. Yakima later sold their buses by sealed bid. In case you missed my updates on Twitter, the search for a new GM is over as the Board of Directors voted to offer the position to Dennis Solensky at the board meeting this month. As of posting this, contract negotiations are still ongoing, but it seems fairly certain that he will be starting by May 15th at the latest. 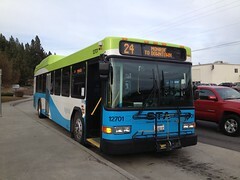 After spending March at Spokane Transit Authority and April at Ben Franklin Transit, the BYD E-Bus is continuing its tour of Washington at Yakima Transit. As with STA and BFT, BYD is letting them test out the bus free of charge for the whole month. No word yet on when/where it’ll be running, but as all routes congregate downtown at the Yakima Transit Center, it won’t be hard to find. After spending two hours interviewing the two finalists and then spending four hours in executive session at the board meeting last night, the Ben Franklin Transit Board of Directors selected Dennis Solensky as the new General Manager. This concludes a long process for BFT, who started this search late last year after former GM Tim Fredrickson submitted his resignation at the December board meeting. Some 84 applications were received, of which about 35 were given a closer look. After whittling it down to a group of 9 candidates, it was further narrowed down to a final two after holding first interviews on Skype. Solensky brings a lot of experience in transit to the table for BFT. All his previous work in the industry has been with agencies similarly sized to BFT, and his last job at Erie Metropolitan Transit Authority in particular showed exceptional numbers for boosting ridership and patronage. He also has a MBA from Penn State, and holds a reputation with former employees as a team player and an approachable leader. While the other candidate, Bill Forsythe, did show excellent qualifications as well, I have to say that I think the Board of Directors has made the right decision in offering Dennis Solensky the job, and I look forward to this new chapter at Ben Franklin Transit.